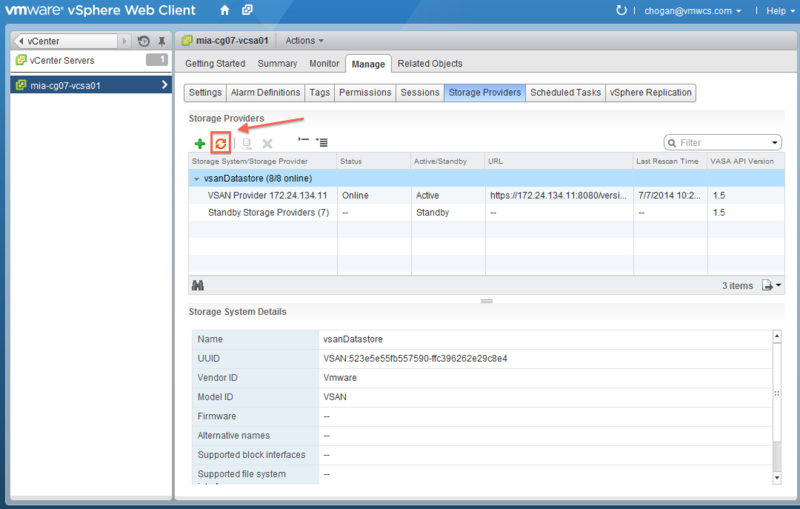 I’m a bit late in bringing this to your attention, but there is a potential issue with VASA storage providers disconnecting from vCenter resulting in no VSAN capabilities being visible when you try to create a VM Storage Policy. These storage providers (there is one on each ESXi host participating in the VSAN Cluster) provide out-of-band information about the underlying storage system, in this case VSAN. If there isn’t at least one of these providers on the ESXi hosts communicating to the SMS (Storage Monitoring Service) on vCenter, then vCenter will not be able to display any of the capabilities of the VSAN datastore, which means you will be unable to build any further storage policies for virtual machine deployments (currently deployed VMs already using VM Storage Policies are unaffected). Even a resynchronization operation fails to reconnect the storage providers to vCenter. This seems to be predominantly related to vCenter servers which were upgraded to vCenter 5.5U1 and not newly installed vCenter servers. When you enable Virtual SAN on a cluster, Virtual SAN might fail to automatically configure and register storage providers for the hosts in the cluster, even after you perform a resynchronization operation. vCenter 5.5 U1b, released last month, resolves the issue. If the Virtual SAN storage providers become disconnected, you simply need to do a resynchronization operation. To resynchronize, click the synchronize icon in the Storage Providers tab, found under vCenter Servers > vCenter > Manage, as shown below. If you do come across this issue, consider updating your vCenter server to version 5.5U1b. Hi Cormac, I had this issue this morning, and resolved it via the KB article from VMware. Another small note to make, I’m using VSAN in vCloud director and the PvDC will alert on no datastore available when this occurs, once resynced, you will have to restart (or at least I did) vcloud services on your cells to make the datastores visible again. Thanks for sharing Harold. Can you share the KB number? Thanks Harold – that doesn’t always work, but glad to know it helped you out.